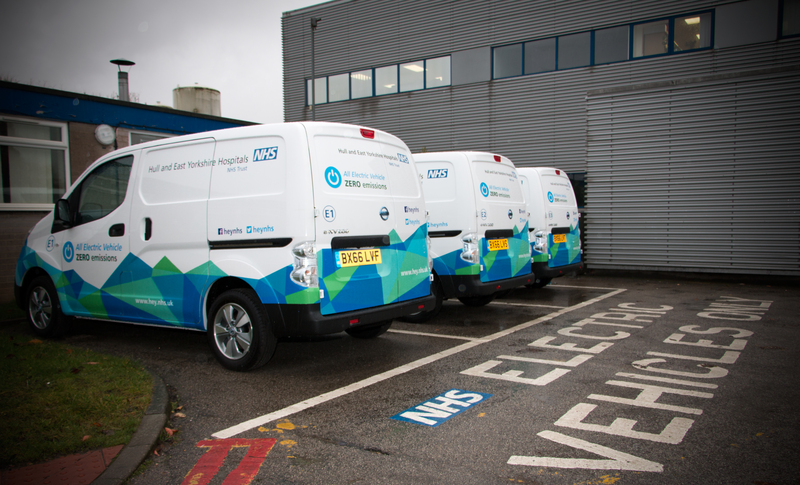 Hospitals in East Yorkshire are showing their green credentials by adding three new electric vans to the fleet of Trust vehicles. Hull University Teaching Hospitals NHS Trust has taken receipt of the three vans as a means of reducing its environmental impact and transport costs at the same time. “Many of the journeys our hospital fleet makes are short journeys, often of just a few miles between Castle Hill and Hull Royal, and sometimes shorter still. “As a means of reducing our CO₂ emissions, demonstrating our commitment to sustainability, and as a way of bringing our costs down, we have decided to trial the replacement of three of our normal delivery vehicles with electric vans. “The vans will help in the day to day running of our hospitals by transporting samples between pathology departments, delivering medical records between sites, and other general portering service duties. Charging stations have now been installed specifically for the electric vans at both hospital sites. The vehicles have also been branded in Trust livery, and are on the move now!